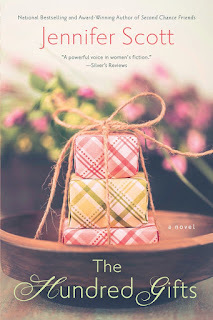 Home / book review / THE HUNDRED GIFTS by Jennifer Scott and GIVEAWAY! 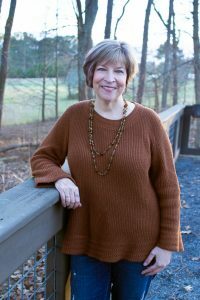 With the holidays around the corner, empty nester Bren Epperson realizes that for the first time in decades, she has no large family to cook for and no celebration to create. Her daughter has moved to Thailand, her son has ditched college to backpack around the world, and her husband has disappeared into the basement to indulge his midlife crisis. So Bren starts teaching a holiday cooking class, and it’s a hit – until Virginia Mash, the old lady living upstairs, bursts in, complaining of the noise, the smells, and the mess. Rather than retaliate, Bren suggests that the class shower Virginia with kindness. So they embark on a plan to lift a heart. As much as Bren Epperson, would like to turn back the hands of time, she has no choice but to deal with the fact that this Christmas isn’t going to be like the happy Christmases of the past. Everyone else seems to have moved on without her – her grown children, independent and living far away; her self-indulgent husband, too preoccupied with his own affairs to pay her any attention; even her widowed mother and aunt making plans to spend the holidays in Las Vegas. When she agrees to teach holiday cooking classes at the new kitchen shop, Bren hopes to find new meaning and purpose for the month of December. But things don’t go according to plan. Recipes fail, cookies burn, the noise level rises. Finally, Virginia Mash, whose apartment is situated directly above the busy classroom, decides she has had enough of the whole business and does everything in her power – even involving law enforcement – to stop the mayhem. And she doesn’t make it easy for Bren and her students to execute their plan to “kill her with happiness,” showering her with one hundred gifts. But as the reasons for Virginia’s anger and bitterness are revealed, Bren and her students become even more determined to see their plan through to the end. 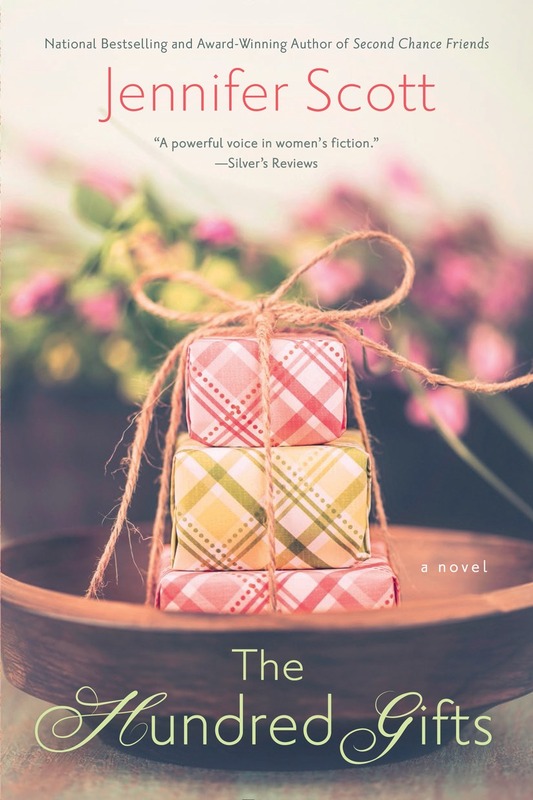 This is a great holiday read, an exploration of the challenges many midlife women face as they attempt to create “the perfect Christmas” for their families while floating in a sea of restlessness and self-doubt. I very much enjoyed spending time with Bren and her new friends and cannot help but wonder if there might be someone in my own life who might benefit from a hundred gifts – or maybe just one. Five warm and fuzzy stars! Very highly recommended! And now I have an early Christmas gift for my readers! Just leave a comment below and you will be entered in a drawing for your own copy of The Hundred Gifts. Comments will close at midnight on Saturday, November 14th and the winner will be announced the following Monday. Good luck!